I started an experiment to see whether the whole JS script code of the Sencha Touch 2 library could be parsed into a JSON representation for further analysis. After going at it a few different ways I was finally able to do it using the Esprima JS library. Here is the JSON representation of the code if you are interested and want to take a look yourself. I used this as part of analysis to compare ExtJS4 and Sencha Touch 2 class libraries. Interesting to find out what code has potential to run unmodified in both of them vs code that probably will not. Here is the link to resulting analysis spreadsheet (17KB). 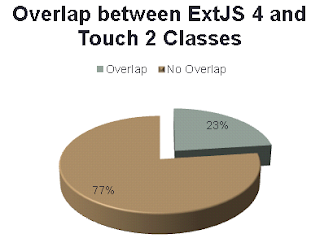 Overall we are looking at a good chance that things will not work; 77% of the classes in ExtJS4 do not have a representation in Sencha Touch 2. Yesterday we had our first Sencha Charlotte Usergroup Meeting. It turned out to be productive discussions around what, when, and how we want to meet. We also were able to put more meat on the bone for future presentation. Thus, this is shaping up to be a good group and I am looking forward to learn new and interesting things. More detail for each of these meetings is available on our group meetup site.